Volunteering and playing an active role in community projects has always been at the core of the culture at Morrisons. Jackie Wright, a legal secretary in our commercial property team in Redhill, recently took advantage of the firm’s scheme to take two days leave each year for volunteering to help out at a local project that is close to her heart. Jackie used her volunteering days to help the local community tidy up and maintain some local World War One (WW1) veteran graves in Reigate. Jackie has had an increasing interest in WW1 after reading the book ‘Birdsong’ by Sebastian Faulks, but it was only in 2014 that she first noticed an advertisement for volunteers to care for graves under the ‘Adopt-a-grave’ programme run by Reigate & Banstead Borough Council. 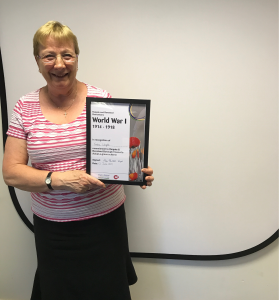 Jackie had already been collaborating with her local primary school to care for a grave at her church, who together help educate children on WW1 as well as organising services for Armistice Day. On 12th June, Jackie and the rest of the volunteers received an award from the Mayor to recognise their hard work and commitment. They were all presented with a certificate, as well as being invited to the Mayors chamber to enjoy a delightful cream tea. We are proud of Jackie’s achievements and congratulate both her effort and commitment to the community.